Karbonn Mobiles have come up with an exciting offering, K9 Music 4G for all you music lovers out there. To keep you grooving on, Karbonn K9 music, as the name suggests is equipped with dual speakers and 3 months of unlimited music download on Saavn App with a great clarity. K9 Music 4Gcomes with 1.3GHz quad-core processor and packs a 16 GB of internal storage. The memory is expandable up to 128 GB via a microSD card giving you ample storage for all your favourite songs, important data and cherished memories. It runs on an Android 7.0 Nougat and is powered by a powerful 2200 mAh battery with a standby time up to 180 hours and talk-time up to 8 hours (2G). This 4G VoLTE enabled device comes with a screen of12.7 cm (5 inches) that keeps you captivated through its vibrant display giving you an excellent visual experience. To help you capture and preserve your beautiful moments, Karbonn K9 Music 4Gcomes with an 8 MP rear camera and a 5 MP selfie camera. Equipped with options like panorama shot, continuous shot, , face beauty, night Mode, face detection and photo filters like blackboard, whiteboard, monochrome, sepia etc.will help you rectify tiny details on the portraits, images and videos captured clicked in any situation to give an end result which will look beautiful and natural. Karbonn Mobiles K9 Music 4G also includes Bluetooth, GPS, FM Radio as well as an inbuilt photo and video editor. The OTG support allows you to connect with other devices providing a solution for user-friendly removable data storage or the sharing of your favourite multimedia files with your phone. Furthermore, App Bazaar will help you get access to the latest apps on the smartphone and the Minus Infinity Launcher lets you discover a multitude of content including daily updates, latest deals and discounts and multimedia contents like wallpapers, music and gaming. 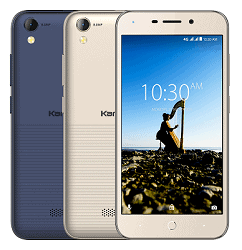 With an aim to provide smart and simple telephony experience, Karbonn Mobiles K9 Music 4G is surely a delight for all the consumers belonging to diverse segments. This smartphone comes in two elegant colours- Blue and Champagne with a premium painting finish and is competitively priced at MOP of INR 4,990. With Karbonn ‘K9 Music 4G’- Relive the unparalleled Smartphone Audio Experience 0 out of 5 based on 0 ratings. 0 user reviews.